1. In a medium bowl, whisk together mayonnaise, chiles, lime juice, honey, soy sauce, and sesame oil; set chipotle mayo aside. 2. Pour oil into a 6-qt. Dutch oven to a depth of 2″ and heat over medium-high heat until a deep-fry thermometer reads 375°. Meanwhile, place bread crumbs and flour on 2 separate shallow plates and set both aside. Whisk together buttermilk and eggs in a medium bowl; set aside. Working in batches, toss hearts of palm in flour until evenly coated, shaking off excess, and then dredge in egg mixture. Place in bread crumbs and toss to coat. Fry, turning occasionally, until golden brown and crisp, 2 to 3 minutes. Transfer to a paper towel-lined plate to drain and season with salt. 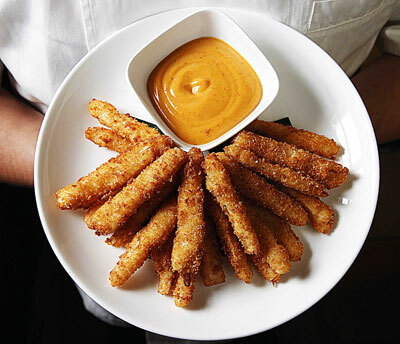 Serve warm with chipotle mayo.